StatisticDescriptor. Describes an individual statistic. Each statistic has a name and information on the statistic it holds, such as its class type (long, int, etc.) and whether it is a counter that always increments, or a gauge that can vary in any manner. StatisticsType. Logical type that holds a list of StatisticDescriptors and provides access methods to them. The StatisticDescriptors contained by a StatisticsType are each assigned a unique ID within the list. StatisticsType is used to create a Statistics instance. Statistics. Instantiation of an existing StatisticsType object with methods for setting, incrementing, getting individual StatisticDescriptor values, and setting a callback which will recompute the statistic’s value at configured sampling intervals. StatisticsFactory. Creates instances of Statistics. You can also use it to create instances of StatisticDescriptor and StatisticsType, because it implements StatisticsTypeFactory. DistributedSystem is an instance of StatisticsFactory. StatisticsTypeFactory. Creates instances of StatisticDescriptor and StatisticsType. The statistics interfaces are instantiated using statistics factory methods that are included in the package. 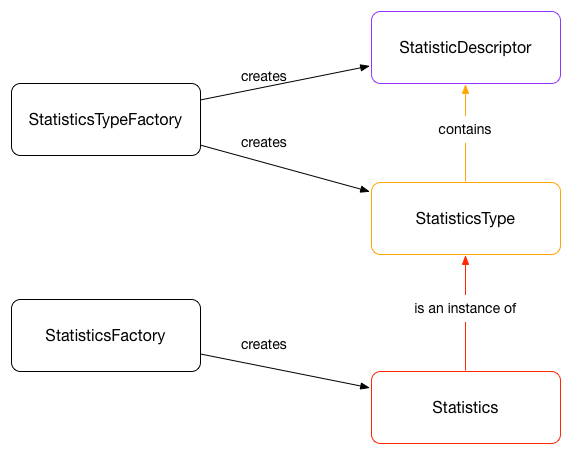 For coding examples, see the online Java API documentation for StatisticsFactory and StatisticsTypeFactory. As an example, an application server might collect statistics on each client session in order to gauge whether client requests are being processed in a satisfactory manner. Long request queues or long server response times could prompt some capacity-management action such as starting additional application servers. To set this up, each session-state data point is identified and defined in a StatisticDescriptor instance. One instance might be a RequestsInQueue gauge, a non-negative integer that increments and decrements. Another could be a RequestCount counter, an integer that always increments. A list of these descriptors is used to instantiate a SessionStateStats StatisticsType. 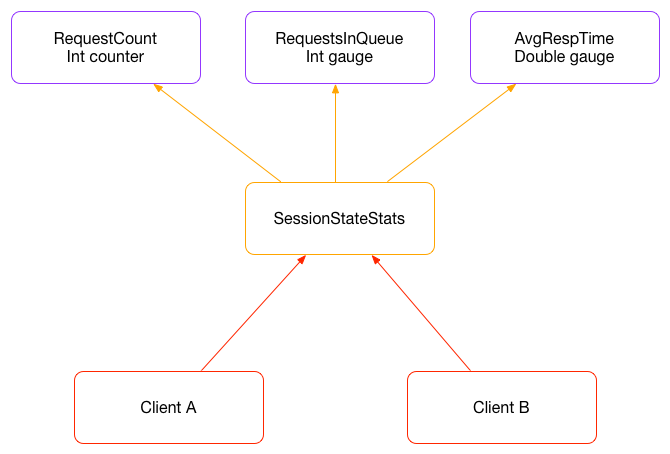 When a client connects, the application server uses the StatisticsType object to create a session-specific Statistics object. The server then uses the Statistics methods to modify and retrieve the client’s statistics. The figures below illustrate the relationships between the statistics interfaces and show the implementation of this use case. Each StatisticDescriptor contains one piece of statistical information. StatisticalDesriptor objects are collected into a StatisticsType. The StatisticsType is instantiated to create a Statistics object. The StatisticDescriptor objects shown here hold three pieces of statistical information about client session state. These are collected into a SessionStateStats StatisticsType. With this type, the server creates a Statistics object for each client that connects.